e-bbex and its associates can undertake your periodic certification tests to ensure that your biological /microbiological safety cabinet is working correctly. 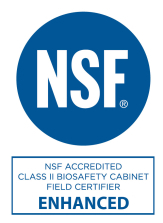 We have fully certified field testing staff certified to both NSF/ANSI 49 and EN12469 and can test all classes and makes of Biological Safety cabinets. Based in Oxfordshire we can travel to any part of the UK, Europe or worldwide and have been active in the Middle East for the past two years (particularly Saudi Arabia and Bahrain). e-bbex and its associates can provide maintenance, testing and certification services for almost any make of Microbiological/Biological Safety Cabinets to international standards and regulations (e.g. ISO 14644, EN 12469:2000, ANSI/NSF 49 and CETA guidelines). Our fully qualified Certifiers, can test and maintain your MSC/BSC to international standards. It is very important to ensure that the cabinet is properly tested and certified when it is first installed. Before selecting your new cabinet please take advice on the siting of the cabninet. The proximity to other cabinets, doors and hvac diffusers and inlets all have an impact on the effectiveness of a microbiological safety cabinet. It is also necessary to re-test the cabinet if it is moved. Whenever a biological safety cabinet is moved there is a possibility of the HEPA filter tearing and rendering the cabinet unsafe. Only a HEPA filter integrity test will be able to determine if the HEPA filter is still capturing the airborne particles. In addition to Safety Cabinets e-bbex tests and certifies laminar flow hoods, workstations, fume hoods, cleanrooms and robotic IV compounding systems. If you have a specific requirement please contact us at testing@e-bbex.com and we will contact you to discuss your requirements. Once it has been established that you need to change the HEPA filter it is important to undertake a proper decontamination of the cabinet and HEPA filter otherwise all the contaminated materials on the HEPA filter can get released into the atmosphere and potentially dispersed around your facility through the HVAC. 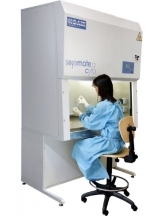 The safe decontamination of safety cabinets is a critical factor in the maintenance of Health and Safety in the laboratory and should only be undertaken by fully trained and certified staff. HEPA filters should not be changed without undergoing thorough decontamination by one of the recommended routes. The OSHA recognised principals of universal precautions should be strictly applied when changing HEPA filters. Contact us if you wish to discuss any aspect of safety cabinet mantenance.